4. Website traced to Toronto, USA. 5. URL of spoof website is very obviously not WAMU. Stay alert! 6. The disguised URL looks secure (https), but the real URL is not! 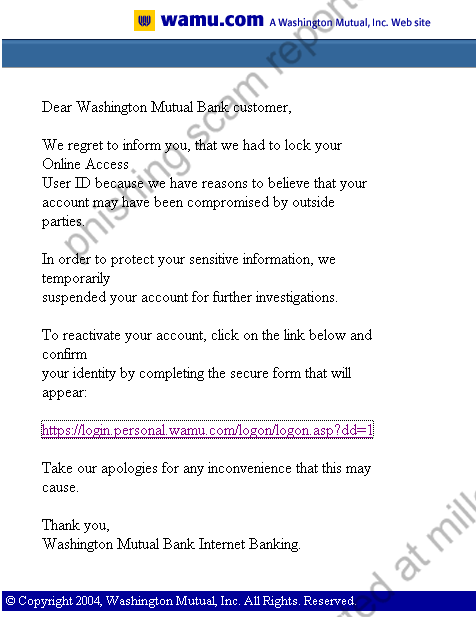 "Dear Washington Mutual Bank customer, We regret to inform you, that we had to lock your Online Access..."
Website not online at time of report. Likely to resemble real WAMU website when online.